I've been talking to a coworker about meal planning recently and her biggest issue is that she doesn't have enough time. When she gets home from work, she spends the evenings at sports practices with her kids. While I still have the relative luxury of a quiet few hours of home after work before my son goes to bed, I can sympathize with her. After all, I don't want to spend those precious few hours in the kitchen. 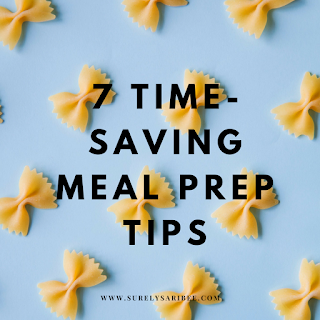 My style of meal planning might be too much for someone who is used to getting a majority of their meals on the go, but here's some baby steps toward meal planning and prepping ahead of time to save time and money throughout the week. 1. Prep produce on the weekend. If you have older children, have a kitchen party for an hour each weekend and chop up salad ingredients, veggies for wraps, fruit for fruit salad and snacks, veggies for snacks, etc. 2. Boil, roast, or blanch some veggies ahead of time then refrigerate or freeze them so all you have to do is toss them in the microwave to serve alongside a rotisserie chicken for a quick weeknight meal. 3. Using your pre-prepped salad ingredients, serve it with a frozen pizza for a weeknight dinner. It's still cheaper and still not as bad as fast food. 4. Double your Sunday dinner. Cook something like spaghetti, chili, a hearty stew, or something else that's easily reheatable for leftovers. Pack the leftovers for lunch at work and/or eat the same thing a day or two later for dinner. My favorite thing to do is chili because it freezes well. I can serve it with cornbread, over pasta, over rice, with tortilla chips, or to make chili dogs. 5. Roast a whole chicken in your crock pot or Instant Pot on the weekend. Pick the meat off of it and store it in the fridge to use in wraps or salads throughout the week. 6. Make two big dinners on a weekend night and only eat part of one that night. This is my favorite thing to do because I'm already in the kitchen cooking and having to do dishes. Since it's just the two of us and a one-year old, it means a good amount of leftovers for us for lunches for the rest of the week. Then, I'm able to fill in the rest of our weekly meal plan with quick and easy things such as ravioli, chicken patty sandwiches, or Aldi's awesome General Tso chicken. 7. Batch cook a breakfast, like baked oatmeal, my favorite Instant Pot steel cut oats, or these carrot zucchini muffins to get some veggie goodness early in the day. Breakfast casseroles are always a good idea! For more ideas, follow me on Instagram. On the weekends, I typically use Instastories to show what I'm doing for meal prep to make the week go by more smoothly.